Don’t worry, it’s just a movie. 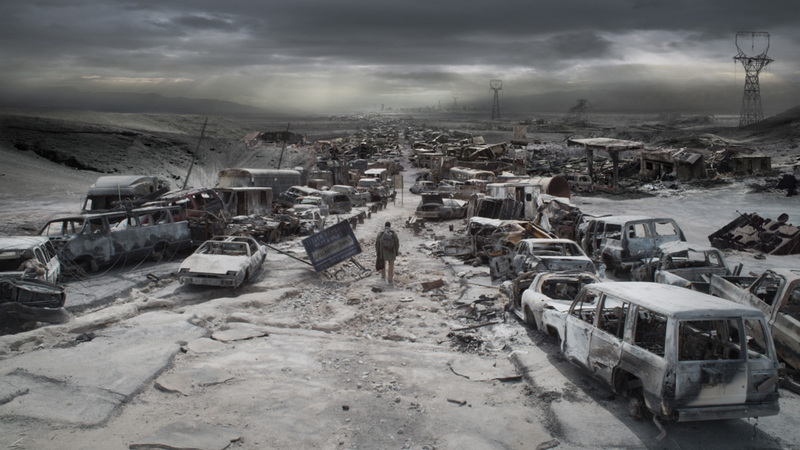 Scene from the 2010 film “The Book of Eli.” Photo: Warner Bros.
It’s a staple of summer disaster flicks: the scene of a panicked populace trying to get the hell out of Dodge. Or, after the bomb is dropped, a band of bedraggled survivors picking their way out of smoking ruins, hobbling along a shattered freeway littered with dead cars, empty except for the decaying remains of their occupants. It’s all good fun in a movie like The Book of Eli. But Escape from New York is also just a movie after all. These days, in the real world, people aren’t fleeing the top cities like New York, Paris and Shanghai. Instead, they’re pouring in. And who can blame them? In the United States alone, winning cities still have a lot to offer: Hot jobs with investment banks or at top medical centers; Foreign films, indie rock shows and used bookstores with quirky cafes; Ethnic restaurants, ethnic festivals and ethnic markets; World-class museums, art galleries and universities; And a hefty dose of people watching. These days, it’s all about how hip Brooklyn has become or how hip Portland and Seattle still are. But for an increasing number of homesteaders, greenhorns and back-to-the-landers, the excitement of being right at the center of things is outweighed by the growing challenges of living in a megalopolis in an age of permanent economic decline. As a weakened economy starts to rub up against the natural limits of life on Earth — such as peak oil and climate change — the biggest cities with populations above a few million may become less and less attractive places to live. Here are the top three reasons why: high costs, crowding and vulnerability to climate change. So far, only rusted-out industrial towns like Detroit and Stockton, California have gone broke to the point where they’ve had to cut back big on municipal services such as schools, streetlights and police. By contrast, even in today’s tough economy, somehow New York, Chicago, San Francisco and other glam cities have managed to look more sparkly than ever. City Hall may be covered in marble, the convention center may be booked solid through 2025 and corporate profits may be up. But ordinary workers in today’s winning cities could still be going broke, due to high costs for housing, energy, insurance, parking and incidentals required to keep up with the Joneses. As the most attractive cities become playgrounds for the rich and privileged, the middle and working classes are being priced out. And while essentials like food and water may still account for only a small part of a megacity dweller’s monthly budget, in a peak-oil future of higher energy costs and strained water resources, pumping in water and trucking in food from hundreds of miles away will start to break the bank, requiring more and more families to have to choose between putting food on the table and paying the (rising) rent. Even as megacities become more difficult to afford, they’ll continue for some time to pull in desperate immigrants and wide-eyed strivers from rural areas. It will take decades for reality on the ground in expensive, dead-end megacities to halt a century of get-rich-quick wishful thinking pushed along by continual advertisements for the allures of big city life in the form of movies and TV shows set in cultural and shopping capitals such as Los Angeles and Miami. Even as the Internet allows more and more people to work outside of big urban centers, the advantages of “clustering” for certain technical and white collar jobs will continue to draw in highly paid professionals to Wall Street, Hollywood, Silicon Valley or Boston’s Route 128 biotech corridor. And because corporate offices will require receptionists, janitors and window washers while upscale families will need maids, dry cleaners and nannies, big cities will also continue to attract low-paid workers, who will find themselves either relegated to a shrinking urban ghetto or to cheap suburbs further and further away from their jobs in town. Everybody’s heard of the urban heat island effect, where lots of pavement and lack of trees can cause cities of one million people or more to get up to 6 degrees higher than surrounding rural areas during the day — and up to 22 degrees higher at night. With climate change, big cities could get hotter faster than everywhere else making it even more expensive to live there because you’ll have to run the AC more. This will be especially true in the new cities of the West and South that were only made possible by air conditioning and cheap oil. Sunbelt sprawltowns such as Las Vegas, Houston and Phoenix — which recently sweltered under record 119 degree temperatures — will experience increasing numbers of heatwaves which may ultimately make them unlivable for children, the elderly and others susceptible to heat stroke. But Boston, New York and Washington won’t be spared. More temperate megacities will also suffer hotter, stickier summers, requiring more AC. That will drive up electric bills and stress already overtaxed power grids, likely ushering in an era of brownouts and widespread blackouts as in 2003 — in turn, disrupting business and adding yet more costs. In an economy where energy is no longer cheap, both suburban McMansions and high-rise condos could become the slums of the future. But at least you can grow a garden at the McMansion. In the high-rise, when the power goes out in a big storm, the doorman has fled, the elevators stop and you don’t want to walk down 50 flights of steps because the grocery stores are out of food, you’ll be stuck eating beans from a can on your Corian® countertop by flashlight. East Coast cities will also have to contend with a future of increasingly weird weather, with regular repeats of the two deadly storms of 2012 — the derecho and Superstorm Sandy. As hundred-year storms start to hit every decade (or more often), many coastal cities will lose some of their most valuable waterfront real estate to sea-level rise. When will FEMA run out of funds to keep (poorly) rebuilding New Orleans? And what will happen to Miami when South Florida begins to merge with the Caribbean? One of those rust-belt cities like Cleveland or Pittsburgh that lack the luster of New York or San Francisco but are both affordable and located safely inland. Many of these cities have enjoyed a partial recovery that has reduced crime while increasing livability. And talk about resilience — their lower density offers more space for growing your own food (even parts of Detroit are coming back, thanks to the grit of their residents and their urban farms). If you’ve got the money, you can join George Soros and other rich guys in selling your gold and buying farmland. Urban retirees with more modest net worth may be able to afford enough land to start a hobby farm. Young people can apply for a farm internship or a fellowship at a rural folk school to learn skills and make contacts to help them get back to the land. A few dozen small cities like my hometown of Staunton, Virginia (pop. 24,000) offer the best of both small town and big city: no traffic, low crime and high quality of life with enough cultural offerings including live theater, ethnic restaurants and an edgy art and music scene, to keep you busy every Saturday night. And while small cities lack big corporate offices or government agencies and thus offer few high-paid jobs, they’re friendly to Internet-connected telecommuters and entrepreneurs alike who appreciate the low costs and charm that small cities offer in spades. Good article. i lived in Sacramento, CA pop roughly 1 million for 44 years. Five years ago I moved to Fort Collins, CO pop roughly 150k. My reasons to favour FtC included affordable public transit, a local university Colorado State, a bicycle friendly culture and extensive trail system. I have been automobile free for 20 plus years and it is great to be able to get downtown in 10 minutes on my bike. I think your article is spot on. Thanks Gypsy Chief. My sister went to college at CSU, so I know what a beautiful area you’re in and what a human-scale, livable town Ft. Collins is. And good for you for going car free. My wife and I have been talking about it for years. We think it would save us money at the grocery store! Seriously, we did give up our second car a couple years ago, but we’re still having trouble saying goodbye to our 2008 Prius. This article makes some of the “usual suspect” arguments but neglects to mention the trend of intensive urban gardening and farming, and also neglects to mention the increasing numbers of people who are living a scaled-back “hybrid” life in the city, combining aspects of homesteading with the dense community that many of us consider a must-have and that is hard to find outside the cities. Cities Rule! And the people who like living in the country should be happy that not everyone feels the same way they do. Otherwise the rural areas would become overcrowded! Some food can certainly be grown in cities, and it should be to increase resilience, but space for food in town is limited by definition and in the end, any city will always rely on rural areas for most of its food (see http://grist.org/food/overgrown-what-happens-when-urban-farms-get-too-big/). And growing your own tomatoes won’t pay your condo mortgage in Manhattan. In big cities, you need lots of money. In small cities you need less money and can get by more on barter, gifts or just doing without. I agree that cities rock — but at the right scale. Big megacities with top tourist attractions are great places to visit! But anyone who cares about peak oil and climate change will probably prefer to live in a cheaper, more neighborly and safer inland city with population of 50,000 or less. We recently moved to downtown Gresham, Oregon to an apartment with a walkscore of 92. We have been carfree since June 2011, and are never going back. Gresham is affordable, within close proximity to the Columbia River, is connected by light rail to Portland, has a major transit center, is along Portland’s most popular cycling/walking multiuse path, and is surrounded by many farms and protected natural areas. I like its chances going forward. Gresham sounds like just the kind of small city that does have a good chance to be resilient in an uncertain future of peak oil, climate change and economic contraction. Sounds like the best of both worlds, far enough from the city to enjoy that small town quality of life but close enough to commute into work or enjoy big city attractions in the evening. Congrats! With the Portland area being the number one place to move these days, even surrounding cities like Gresham are fast becoming overcrowded and unaffordable! Rents have practically doubled, traffic is a nightmare, and we’re seeing litter on roads you’d never see it on before. The whole Portland metro area has reached critical mass, people! Please stop moving here! We have loved this area for decades, and it’s heartbreaking to see the horde’s descending and all the subsequent havoc and chaos ensuing. We’re !looking to escape. Sigh. Thanks Erik. I have lived in Houston for 40 years. After watching re-runs of “Walton’s Mountain”, my heart sometimes feels like it truly belongs in the country or in a rural community. I have always wondered if a city boy can “make it” in a rural area. I’ll retire in about 6 or so years and I’m single. It would be starting over completely. I’ll let the Lord lead as He always does. Again, thanks for an excellent article. Thanks for your nice comment, Rick. Greetings to you in Houston. We live near Walton’s Mountain in Virginia, so I was glad when my wife suggested we watch the show a couple years ago. It might sound corny, but I found the family values heartwarming and inspiring. And the show was a real impetus for both of us as urban escapees on our quest to become more self sufficient living in a small city. So best of luck to you in your journey!